Quakers believe in Peace. Film About Friends profiles five from the Mount Toby Meeting. They reach their belief from different backgrounds. David, an ex-Marine, knows the horror of war; Frances, a peace activist, has been imprisoned for her activism; Mary studied nonviolence in India; Margaret searched for peace in her professional life; and John prevented conflict by feeding the world. The film's director Joe Fenstermaker lives in Brooklyn and attends Brooklyn Meeting. Joe will be present at the screening with a question and answer period after the film. 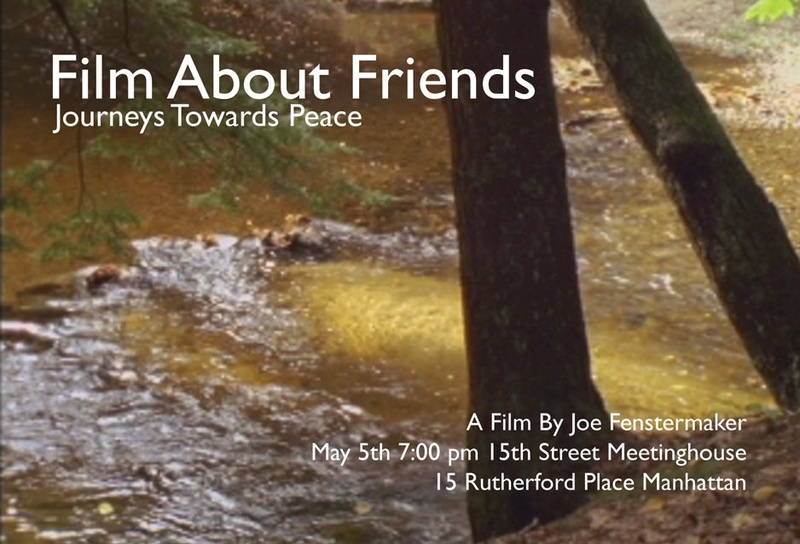 Film About Friends: Journeys Toward Peace introduces five members of the Mount Toby Friends Meeting in Leverett, MA engaging in work that represents their fundamental values and beliefs about Peace. The individuals profiled range in age from 40 to 90 years old and illustrate how one can live a peaceful existence in each stage of life. From these portraits emerges an understanding of Peace as seen through the lens of the Quaker faith and, by extension, how leading a peaceful existence can impact all members of society. An observational framework places viewers in the physical and spiritual perspective of Quakers. The film documents each life with the care and precision of a portrait film. Subjects respond to the viewer, recounting their journey towards Peace with past examples and current struggles. To maintain unity, the themes of Quaker faith and a belief in Peace weave individuals together. The characters’ lives speak in a calico unity of overlapping and opposing visions of Peace, as witnessed personally through their Quaker faith. The film ends with the silence of an unprogramed Quaker meeting, and all scenes in the film function within a Quaker context of silence and simplicity. No narrator tells the audience what to think, and no music tells the audience how to feel. Viewers in this peaceful environment may examine and consider their lives, as Quakers do, by questioning and engaging in a dialogue with themselves. Quotations appear between major thematic junctures in the film to foster and promote ongoing self-examination for viewers. Quakers listen, discuss, and act on the inner light that they believe is fundamental to all people. This process involves reflection and action; filmmaking also requires a similar intellectual progression. This film is guided and mediated by the constraints that shooting on 16mm film fosters. Every decision must be made earnestly because the format forces structure and deliberation into the creative process. The film runs approximately an hour in length, providing enough space to explain, reflect on, and illustrate the individuals profiled.